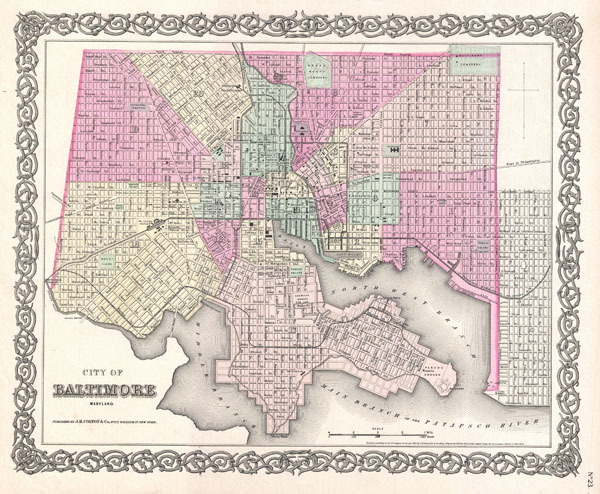 An excellent 1855 first edition example of Colton's rare map of Baltimore, Maryland. Covers the city from Gwinns Falls (and Bridge) to Seventh Street and from Green Mount Cemetery to the Patapsco River. Hand colored in pink, green, yellow and blue pastels to identify city wards. In general this map offers extraordinary detail at level of individual streets and buildings. Identifies the city Hospital, Railroad Depot, Mt. Clare Station, St. Mary's College, and the City Jail. Surrounded by Colton's typical spiral motif border. Dated and copyrighted to J. H. Colton, 1855. Published as page no. 23 in volume 1 of the first edition of George Washington Colton's 1855 Atlas of the World. Rumsey 0149.029 (1856 edition). Phillips (Atlases) 816.